(Nashville, Tenn. – April 20, 2017) – Ty Herndon’s 2017 Concert for Love & Acceptance, hosted by Cody Alan, announced its initial artist lineup, with more to be announced in the coming weeks. In addition to Ty Herndon, this year’s talent lineup already includes Billy Gilman, Kree Harrison, Ryan Kinder, Runaway June, Lorrie Morgan, Michael Ray, Street Corner Symphony, and Thompson Square. 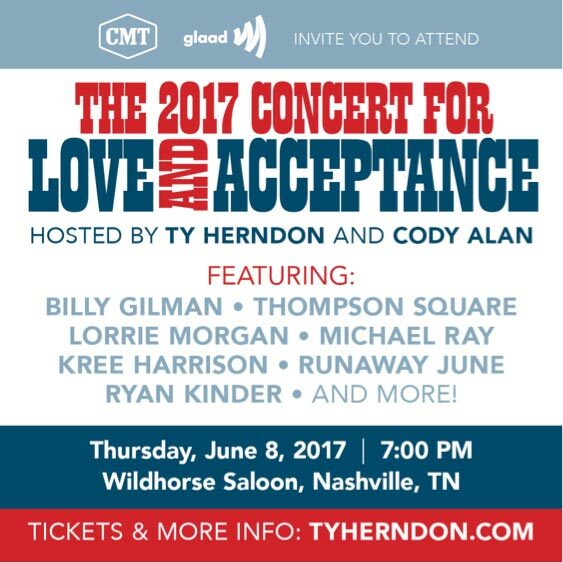 The event, created to support at-risk youth, will be held on Thursday, June 8th starting at 7 p.m. at Wildhorse Saloon in Nashville, Tenn.
Grammy-nominated and Dove Award winning artist, Ty Herndon created and co-hosted the first Concert for Love & Acceptance alongside GLAAD in 2015, when his 20th anniversary fan club party turned into a coalition of artists gathering in support of Nashville’s at-risk youth. The driving force behind the benefit is Herndon’s desire to foster positive cultural change and encourage Nashville’s youth to live to their fullest potential. This year’s partners include media partner CMT and nonprofit partner GLAAD, as well as local sponsors Mitchell Gold + Bob Williams, Wade Weissmann Architecture, and Retief Skin Center. The first Concert for Love & Acceptance received national attention from Boston Globe, Rolling Stone, Entertainment Tonight, People Magazine and more. A philanthropist at heart, Herndon has also donated his time to organizations such as the Trevor Project, Make A Wish, St. Jude, GLAAD, HRC and Feed the Children. ‪For more information on Concert for Love & Acceptance or to purchase tickets, please visit www.TyHerndon.com.